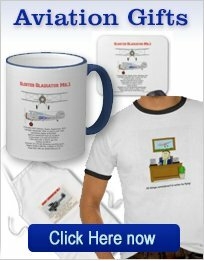 RC Airplane Engines and the support equipment required. All RC airplane engines require some form of support accessories to fuel up, start and do simple field maintenance. Here are hints and tips on selecting the best for your application. When you are starting out in this hobby, keep things simple and inexpensive. The "Field Pack" from Hangar 9, shown below is an excellent starter kit (like the pun?) and it's price is very good. The manual fuel pump included should be mounted to your fuel bottle and the fuel tubing hooked up and you are ready to start most RC airplanes engines. The actual box is cardboard but it should last long enough until it can be replaced by a more substantial wooden or plastic field box. This kit will enable you to fill the tank, ignite the glow plug, and start your RC airplane engines by using the "chicken stick". 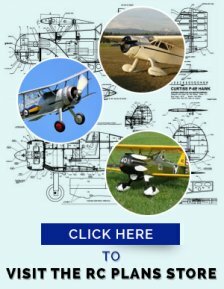 You can also change the plug and the propeller. This is all you need to get going- as you will see below, things can get a lot more complicated! Electric Starters are available in many shapes and sizes. 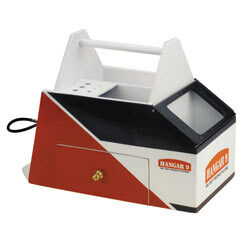 The Hangar 9 model shown is a good general purpose, heavy duty type that should last a lifetime and start anything but the largest of RC airplane engines. The alligator clips that are usually supplied can be replaced by phono-plugs to allow the unit to be plugged in. It all depends on the set-up you use. Once you have acquired this number of RC accessories, I think the cardboard box, shown above, will be inadequate to carry the weight! 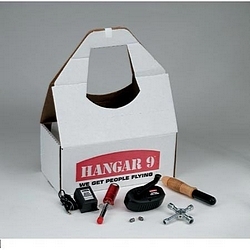 The Hangar 9 Field box is only available as a build it yourself kit. The fuel bottle is strapped to one end and the 12 volt battery is placed at the other end to balance things out. The center area is where your tools can be stored and various small parts and RC accessories can be stored in the drawer. A word of warning! If too many tools and stuff are stored in the Flight Box, it can get very heavy! I always take a separate tool box that contains the heavy tools and leave it in my car. The only tools in the Flight Box are for simple field maintenance, such as changing plugs etc. 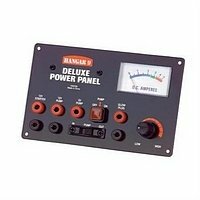 In my experience the above listed equipment will last a lifetime and service and start all RC airplane engines up to 1.6 (27cc) capacity. For the larger engines we require more power! An alternative to the above, is the field box shown here. 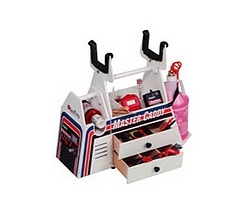 The Great Planes Master Caddy Field Box Assembled. The big advantage of this box is that it comes pre-assembled and painted. One feature I like is that the starter and 12V battery are in a separate "Power Module" that can be unplugged from the main box. You can fuel up in the pits and take the power module with the plane. The fuel pump can be reversed for emptying the tank and the voltage for the glow plug can be adjusted. 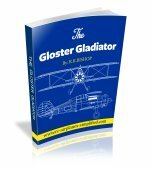 This last feature can be very useful when starting flooded RC airplane engines by slightly increasing the voltage to the plug. Please be very careful when in this kind of situation. Remember the starter is powerful and if the flooded RC airplane engine is turned over in this condition (known as hydraulic lock) then a severely damaged engine will be the result! Always check by turning the engine over a few times, by hand (with the glow plug disconnected!) If it will not turn over, then the engine must be relieved, by removing the plug and turning by hand again, until all that fuel is removed from the engine's cylinder! As you may realize, I am not a great enthusiast of plugging the glow into a panel! 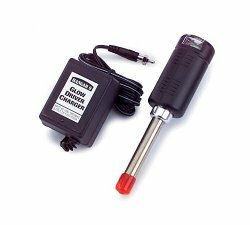 It is good to have it as a back-up, but I much prefer to use a separate, battery powered glow igniter similar to the one shown here. A long electrical cord from the panel to the glow plug is required. This must be kept out of the propeller and is an obvious safety hazard. If the 12 volt battery is low, then running the starter and the glow circuits at the same time will really lower the power and probably result in a no-start. 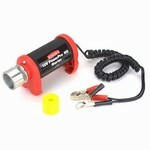 The next items to consider are a tachometer and a battery checker. The tachometer is used to check engine RPM of RC airplane engines and is a good indicator that all is good in the engine department. Once you have established a good RPM that results in a successful flight then this RPM should always be the same. It is also a good idea to check the low speed RPM. This should give you a safe, reliable idle speed for landing. I prefer to set-up the throttle with the throttle trim lever fully forward. When the landing is complete and the taxi back to the pits is complete, the throttle can be closed completely by using the throttle trim lever. Note that a safe idle speed should be at 2000 RPM or even a little lower. In the world of RC airplane engines, the battery checker is an essential tool. It is used to check the onboard battery voltage. It is a great idea to check this before every flight. The checker is an expanded scale voltmeter (ESV) that measures battery voltage very accurately and is clearly marked with a green "OK" zone. DO NOT FLY if the battery voltage does not reach the green zone, when under load. 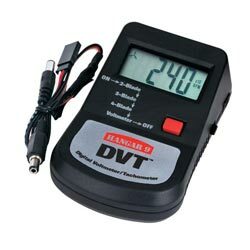 The photo above shows the Hanger 9 DVT Digital Voltmeter/ Tachometer (HAN 111). This new unit combines a tachometer with a battery checker. This unit can check the receiver and transmitter batteries, under load and can be used with either JR or Futaba or Spektrum transmitters. 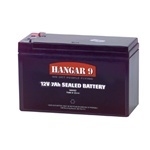 The final item to consider, for your flight box, is a 12 volt fast battery charger. The 12 volt applies to the input voltage of the charger. The unit can be plugged into your car's 12 volt outlet and receiver and transmitter batteries can be charged. Please make sure that the charger is compatible with your batteries! If you are using Gas powered RC airplane engines, then you must ensure that the complete fuelling system is gas compatible. Some Glow components will actually melt when exposed to gasoline! If you fly both Gas and Glow, then you must have two separate fuel systems. Gasoline flyers should also carry a fire extinguisher. Remember that gasoline is extremely flammable and I have seen fires on the flight line! As always practice safety first! Some of today's RC airplane engines are NOT TOYS! Serious injuries and even death can result from miss-use of these units and models!